Graduation is a time for excitement, new possibilities and now, Italian charms! 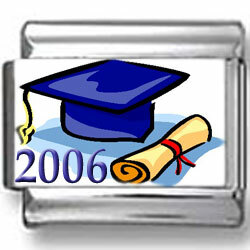 Adorn your Italian charm bracelet with this Italian charm featuring an illustrated blue graduation cap and yellow diploma with “2006” written in the bottom left-hand corner. It is a true noteworthy charm.